Chairs arrived today in perfect condition. Courteous delivery people. Thanks. I received my four solid oak windsor chairs and the clipped corner oak pedestal table today. They are wonderful. I am especially pleased that they fit so well in my small kitchen, yet the table expands easily for card nights with my friends or dinner when my family comes over. I am glad that I spent a little more money for solid wood, as this pedestal table and chairs will surely last a lifetime. Thank you for sending me the stain samples and helping me to make decisions about the set. I am very satisfied and feel I made the right decision. Please pass along my thanks to the Amish men that made it and to the driver, Frank, who was very helpful. I will recommend Dutchcrafters.com to my friends! 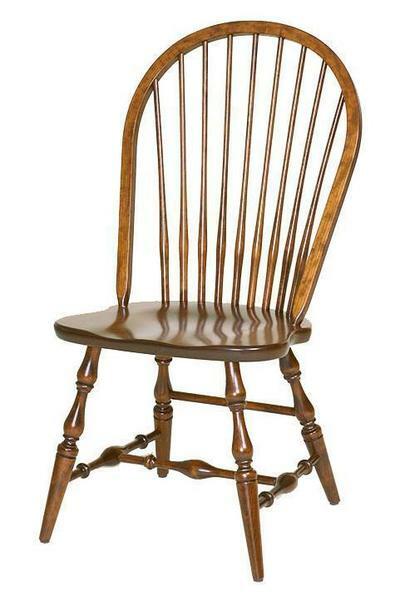 I love the New England Windsor armchair I purchased. It’s in the front entrance of my home and it looks great.